Cleaning your baby stroller is very paramount. You kids should always stay in a clean environment especially when traveling. Therefore, you should dedicate some time to make your stroller cleaning. The best idea is to schedule a cleaning routine mostly thrice per month. 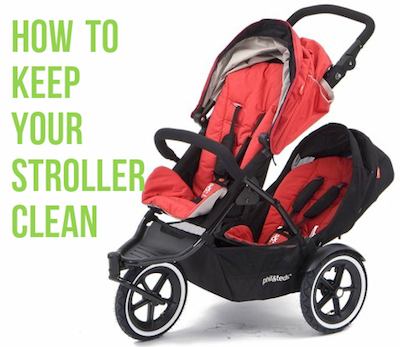 However, if you use your stroller, frequently you may have to clean it on a weekly base. In some case, the stroller fabrics may have visible dirt and stains. The fabrics may be looking shabby, there may be crumbs in the crevice, and the frame may be sticky. Virtually any dirt can be cleaned to give the stroller a pleasing look and even making it appear as good as new. If you want to clean deep your stroller, start by stripping all the fabrics to expose the frame and other internal parts. A toothbrush or a special small brush is perfect for the crevices. It may take you a couple of hours to clean and dry all the fabrics. But some few stroller fabrics can be taken to a dryer to achieve excellent results. You will need some energy to make sure the whole travel system is sparkling. Before you start any cleaning process, read and understand the user’s guide (the one provided when purchasing the stroller). Mostly, this guide contains information and instructions about stripping the seat fabrics, basket and canopy – the parts that require constant cleaning. Remove any loose dirt first. Begin by emptying the storage baskets of the stroller and remove all detachable accessories and toys. You will need a vacuum cleaning in the next step. Vacuum all the reachable parts of your stroller concentrating on the basket and seat. Most handheld vacuum cleaners are ideal for this vacuuming process. All the stroller parts do not have the same texture, and thus there are the “soft” parts i.e. the seat fabrics, the basket and the canopy. For spot cleaning these parts, it is advisable to use dish soap like Dawn. You can also use a gentle hand-washing detergent. Put a small quantity of detergent or soap on a clean wet cloth and rub the stains. Then rinse the cloth in pure water, blot the spot with a moist cloth till the suds subside. If possible, leave it to dry in the sun. Now turn your focus on the “hard” parts (these include the plastics and metal). You can use a natural multi-purpose spray cleaner and a plain, dry cloth. Start by spraying the cleaning solution onto the plain cloth. Then scrub the metallic and plastic parts of your stroller. For sticky patches and stubborn stains, you should add some more elbow grease. Ensure to dry all the metallic parts thoroughly. Because the sun may not be reliable, you can wipe these parts using a dry cloth. Never forget the wheels! You can use various baby wipes to wash around the rims and wheels. If the stroller has air tires, you can pump them up. Ensure you use a hand pump and don’t over inflate them. Some strollers require a small amount of air while others must be fully inflated. Check to ensure the swiveling wheels are functioning smooth and remove any obstacles. The above guide contains sure ways of keeping your baby carriage clean all the time. To ensure, you get the expected results we insist on reading and understanding the user’s manual. Sometimes your stroller may have very stubborn stains that fail to come out even with much cleaning. In case of stubborn stains, you may contact the stroller manufacturer for some guidance. If you maintain the stroller clean, your kids will have a good health.